The project planning phase is key to setting the roadmap for your team to follow to reach your intended project outcome. Nail this phase and your likelihood of delivering a successful project increases exponentially. Within this article, we detail how to create your project plan broken out into phases and milestones to help estimate specific project costs, assess required and available resources, and determine potential risks and ways to mitigate them. You’ll also find a range of helpful resources, free templates, and guides to get you started. With all the factors involved in a project, it’s easy to overlook a detail that could potentially lead to missed deadlines or budget overruns. Any project or plan can be made more manageable by breaking it down into individual tasks. One way to do this is by creating a work breakdown structure (WBS). A WBS is a visual representation that shows the scope of a project broken into manageable sections. From there, your task list can be made in a variety of ways, whether on a whiteboard or in an online task management tool, finding what works for you and your team and the project at hand is key to ensuring nothing is missed. Some project managers and teams find it helpful to use a task list template to quickly get started with their lists. We’ve included a link below to a complete list of task list templates for you to use. Once you have your task list created, start grouping tasks together into phases and then set milestones for each phase. This will help you determine which tasks must happen when and which tasks are dependant on others. Now that you have your task list set, you’re ready to create your timeline. A timeline is helpful to provide a visual representation of the all the tasks within your project and how they are connected or dependent on each other. At this point, you will estimate and set start and end dates for each of the tasks within your list. Determining duration of individual tasks will help give you an idea of the finish date of your project. Tip: Be sure when estimating dates that you provide a small buffer to account for any issues that may arise. 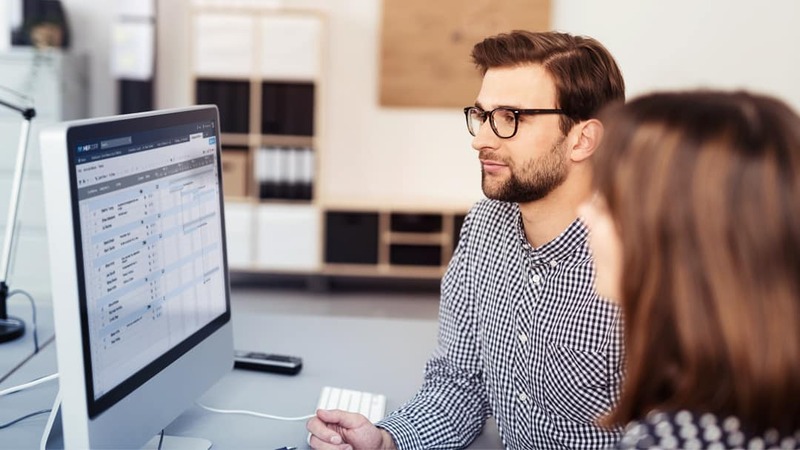 Although there are many ways to create a project timeline, one that successful project managers often use is a Gantt chart. 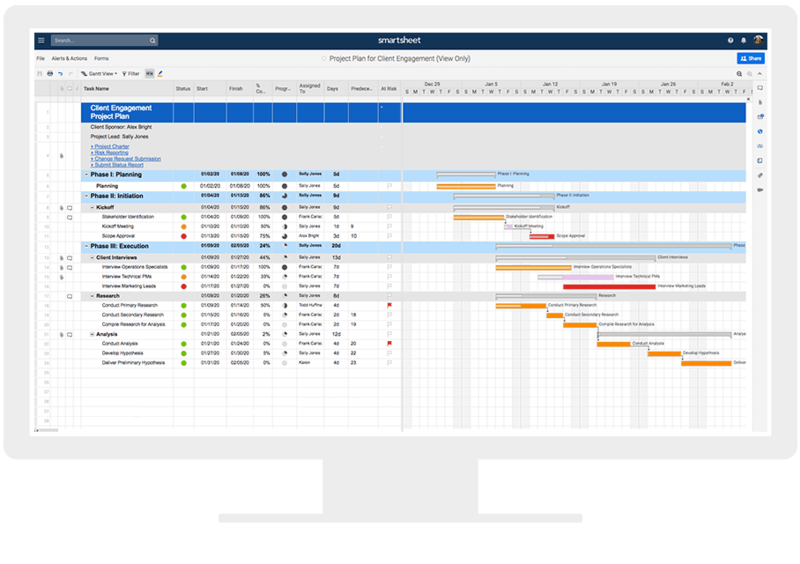 Gantt charts are visual timelines that display tasks as bars and enable you to track progress, map your critical path, show dependencies, and make updates by changing task duration. With your timeline ready to go, you need to consider which resources are available to keep your project on time and on budget. Making the best use of the resources you have is what will help get your project to the finish line. Resource management is designed to allocate human and tangible assets — finances, materials, and equipment — efficiently and effectively. Yet it is one of the most difficult processes to control, maintain, and achieve success. It is also important to assign roles and responsibilities to your team members at this time. This sets expectations up front, ensuring that each team member knows what they are responsible for. Within your project plan, define who is going to do what, by when, and then stick to it. No matter what type of project you are managing, successful projects require accurate cost estimates. Cost estimations forecast both the budget and the resources needed to execute your project. In turn, project objectives are achieved within the approved timeline and budget. A cost estimate is the sum of all costs required to successfully complete a project through its duration. Although there are many ways to categorize the types of cost items, the most simple way is in two categories: direct costs and indirect costs. Direct Costs: Expenses billed to a single project, like project team wages and costs to produce physical products. Indirect Costs: Expenses that are not associated with a single project, but rather, are used by multiple projects simultaneously. Risks are an inevitable part of any project. That’s why it’s critical to consider and assess potential risk before jumping into the execution phase. First, it’s helpful to think through and list if/then scenarios. For example, “If we go over budget in this first phase, then X will happen or need to happen.” In this case, “X” could be an adjustment made to scope, budget, timeline, etc. 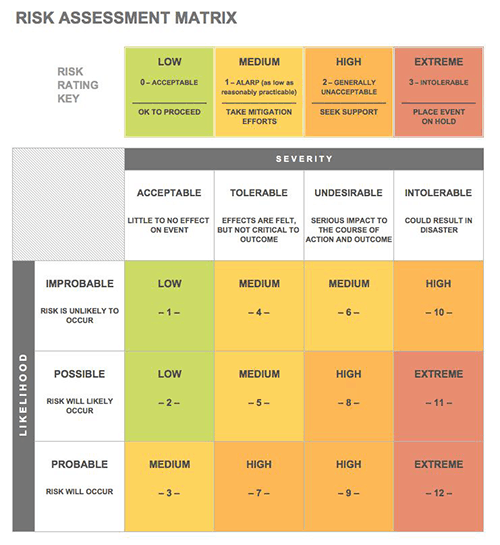 Next, you’ll want to create a risk assessment matrix, which is used to help evaluate and prioritize risks based on the severity of their impact and their likelihood to occur. By assessing existing and potential risks, you can estimate their impact and adjust your project timeline accordingly, and then make a plan for responding to the risks if they occur. Learn more about creating your risk assessment matrix including templates to get started, within the article linked below.